The JLL T350 Digital Folding Treadmill, is a perfect solution to weight loss and fitness. Stay healthy, burn fat, tone muscle and improve your shape at home! This folding treadmill is ideal for those with limited space, and with its built on wheels it can be easily transported from one room to the other. Up to 20 professional programs, speed range from 0.3 km/h to 18km/h, and to keep you up beat Bluetooth and speakers integrated. Digital Folding, Professional Programs, Bluetooth and Speakers, great value treadmill. There are many treadmills available in the market today. 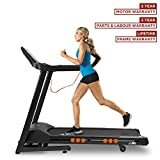 The reason why this is such a great choice is simple: more programs than any other – 20 professional programs, more kilometers – up to 18km/h, easy to move around with its built in wheels and easy to fold and unfold with the hydraulic arm that locks the treadmill into place. When unfolded it is 158cm long, 70cm wide, and 128cm tall. When folded it is 82cm long, 70cm wide and 146cm tall. Ideal for limited space. Its running belt is 121mm long x410mm wide, it gives you all the space you need when running and can be easily stored anywhere when folded. Speed ranges from 0.3 km/h to 18 km/h. 5 CHP (Continuous Horse Power)/4.5 PHP (Peak Horse Power) motor. Incline ranges from 0 to 20 levels. 5-inch LCD backlight monitor displays time, speed, distance, heart-rate and calories. 20 running programs, first 3 programs can be customized. 16-point cushion deck absorption system. Plenty of running area with 121 cm in length and 41 cm in width. iPod, iPhone and MP3 Bluetooth connectivity enabled and USB interface. Come with a program booklet with a progress plan that helps your achieve your fitness goals. LCD monitor is touch sensitive, no buttons to wear out. Every program in the progress plan has been created and tested by experts. Soft drop system that allows the treadmill to be easily and smoothly unfolded. Nearly as good as a gym treadmill, only happy customers after purchase and actually taking their first runs. New and improved model! I found only 16 reviews and every single one shows how satisfied customers are what great value they have gotten. Customers place the JLL T350 Digital Folding Treadmill, 2018 New Generation at the top of any other in the market. Awarding it a 5.0 out of 5 stars on every review. No there is not. There are handles in each side. So it does have accessible handles, and this modern design allows you better running space. Should You Buy JLL T350 Digital Folding Treadmill? In summary, the JLL T350 Digital Folding Treadmill, 2018 New Generation offers all that one normally look for in a home use treadmill. It allows you to fold and unfold easily and securely, you can store it anywhere, it is equipped with Bluetooth and Speakers, and it offers your 20 professional programs to choose form. All customers are extremely pleased with their purchase and have recommended this treadmill to others.